Tinseltown's awards season is in full swing, and everyone is obsessed with dressing up, scoring free swag, and getting invited to the biggest awards shows of the year. But when celebrity publicist Lyla Davis is killed, the festive mood comes to an abrupt halt. Apprentice private eye Dayna Anderson thinks she's uncovered the killer. Unfortunately, what starts as an open-and-shut case turns out to be anything but. Diving deeper into the investigation, Dayna gets a backstage look at gossip blogging, Hollywood royalty, and one of entertainment's most respected awards shows--all while trying to avoid her own Hollywood ending. Kellye Garrett (East Orange, NJ) spent eight years working in Hollywood, including a stint writing for Cold Case. 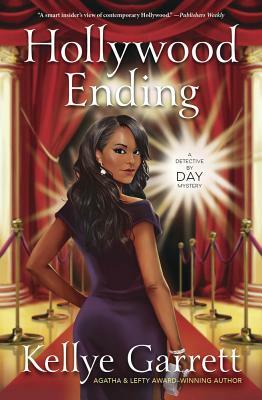 The first book in her Detective by Day Mystery series, Hollywood Homicide, won the Agatha, Lefty and Independent Publisher "IPPY" awards for best first novel. A former magazine editor, she holds a BS in magazine writing from Florida A&M and an MFA in screenwriting from USC's famed film school. She now works for a leading media company and brainstorms ways to commit murder for her novels.